​The Weed Wrench™ is used to manually uproot unwanted trees and saplings with 2—2 1/2 inch stems. It is made in the USA of heavy steel . Rental terms: $225 deposit; $20 rental fee for 1-3 days; $20 for each additional day; signed rental agreement. Used to plant tree seedlings by hand. $40 deposit. Refundable deposit when returned. Great Plains Drill (for CRP Practices only) works exceptionally well for creating conservation buffers as well as food plots and small acreage farming. 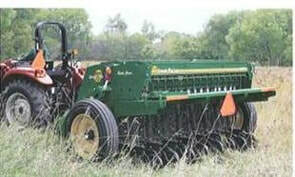 Equipment is delivered to the customer by district staff who also explains usage details of the implement. For more information contact Jim Carter at 419-354-5517.